Many social media channels are centred around doing one thing, such as curating links or sharing videos. Yet mostly, people don’t use these channels to do the sharing itself. For example, Instagram is a social media channel in itself. You can post pictures to it, add captions, favourite pictures and comment on others. Yet much of the time Instagram pictures are being spread through other sites, mainly the apparent current ‘big three’ of Social Media – Twitter, Facebook and Tumblr. Even though Facebook has always have it’s own picture upload – one of it’s most popular features when the site became popular in 2005 was the ability to share photos, especially in albums and with captions (although of course Facebook owns Instagram, so they promote it’s use!) Likewise twitter has it’s own photo uploading service, which even emulates instagram by using filters, but many people prefer to share Instagram-to-Twitter despite the pictures not showing up directly in Twitter feeds. Vine has it’s own community of video makers who work solely within the platform, but most people who create vines are sharing them to other platforms. Even YouTube, whilst it has commenting, friend requesting, and even video responses is more of a hosting site where interaction takes place, but the main impetus for media spreading is through sites like Twitter and Facebook. Overall, it comes down to that accessibility, and the the fact that Facebook and Twitter are the most versatile platforms, especially when it comes to creating an online profile. However, people still seem to want to share to multiple platforms. It’s almost as if social media has developed ‘primary and secondary levels. While the platforms I’ve mentioned have the capability to stand on their own, in general they have been adopted by people to link them to another. 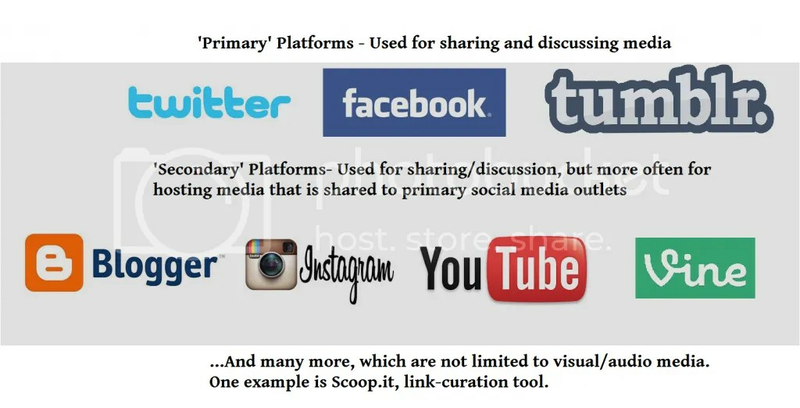 Obviously, there are other popular outlets that fall between this – for example, Pinterest, which is a more self-contained form of link curation and sharing, or Flickr, which as a photo-sharing site should seem to fall under ‘secondary’ but actually sustains it’s own communities.